Yay for sweater weather, fuzzy boots, pumpkin everything, cinnamon spiced goodies, and football!!!! Totally kidding about fooseball, y’all. Definitely not a fan. I am, however, a fan of making a smorgasbord of test recipes and shoving them in the faces of my husband and in-laws on game day. 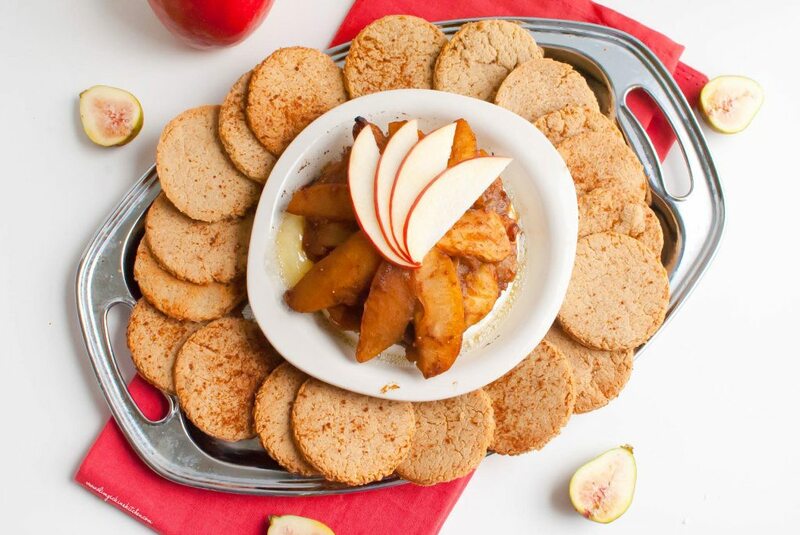 That’s exactly what I did when I tested this recipe for baked brie topped with vanilla and cardamom spiced apples and served with gluten-free cinnamon crackers. I made it, photographed it, put it on the table in front of my family and, after a few “Oh, wows” and “Mmmm, mmmm, mmmms” I knew I had a winner. Taste testing this baked brie almost went down like my spring roll recipe. We continually crammed crackers into our mouths until there was nothing but a few slices of brie skin and a dusting of cracker crumbles left on the tray. If there is one thing in life I’m certain about it’s that my brother-in-law will give me an unbiased opinion on whether or not my recipes need work. He could not stop swooning over this and just kept saying how much his wife would love it. I guess I know what I’ll be making for the family Christmas party this year! 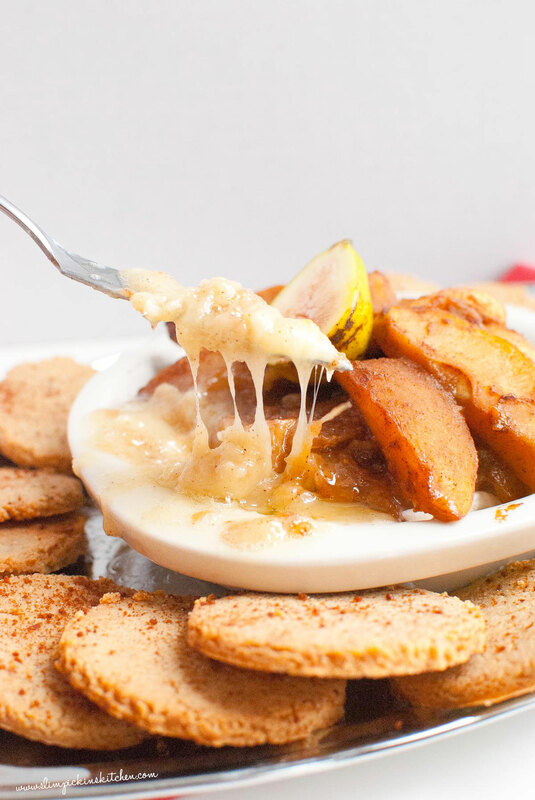 Baked brie is always a must when at a holiday party and, though there are a lot of steps for this recipe, it really is easy to make! Pull together the vanilla and cardamom spiced apples first and pop them into the oven. Then make your cinnamon cracker dough. As soon as the crackers are cut, pop them onto a baking sheet. Then unwrap your brie and place it in a small oven safe baking dish and put it next to the apples on the top rack of the oven. Lastly, place the baking sheet of crackers on the middle rack and wait as the intoxicating scents of cinnamon and cardamom fill your entire house. Gah! I love the smell of fall! I adore having my home smell like the seasons. During the spring I’ll burn floral candles, the summer I’ll burn something beachy or peachy, and the fall is full of pumpkin and cinnamon. Come Christmastime the smells of spruce and and yule logs are all up in her. Loves it. 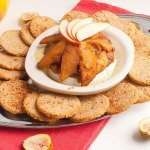 Baked brie is always a crowd pleaser and, when you make this, I’d be shocked if you have any leftovers. Also, you can feel good about eating this bubbling cheese! There is ZERO refined sugar and the crackers are both gluten-free and grain-free and are full of protein. So you’ve got your fruit, dairy, protein and healthy fats thrown together in one dish. Preheat oven to 350 degrees and spray a 9" x 13" baking with non-stick coconut oil spray. In a large bowl, add apples, figs, cider, vanilla, coconut sugar, cardamom, nutmeg, cinnamon, and salt and stir until all of the apples are well coated. 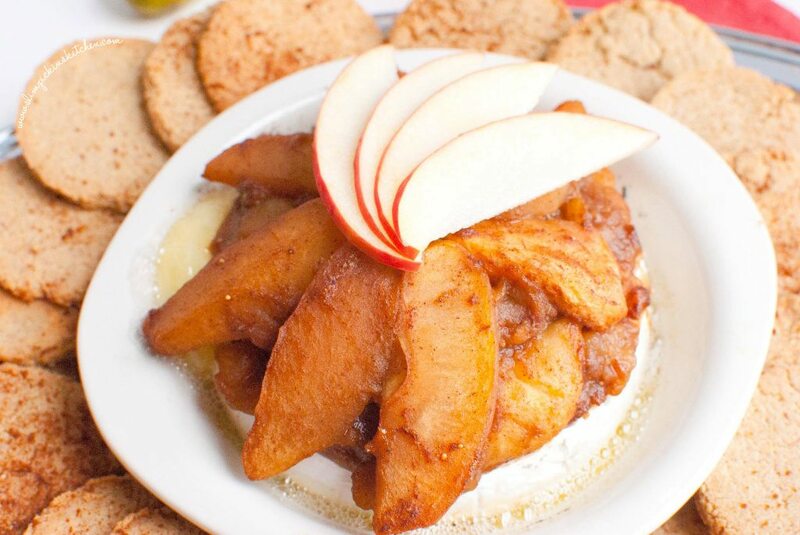 Pour apple mixture into the baking dish and bake for 30-35 minutes or until apples are bubbling and tender. Add all ingredients to a food processor and pulse until the dough comes together and forms a ball. Place the dough in between two sheets of parchment and and roll into a large thin rectangle, about 1/16" thick. Cut the dough into squares or circles and place on a baking sheet lined with parchment. Remove the brie from the wrapper and place in a small oven safe dish. Bake for 12-15 minutes or until melted and slightly oozing. 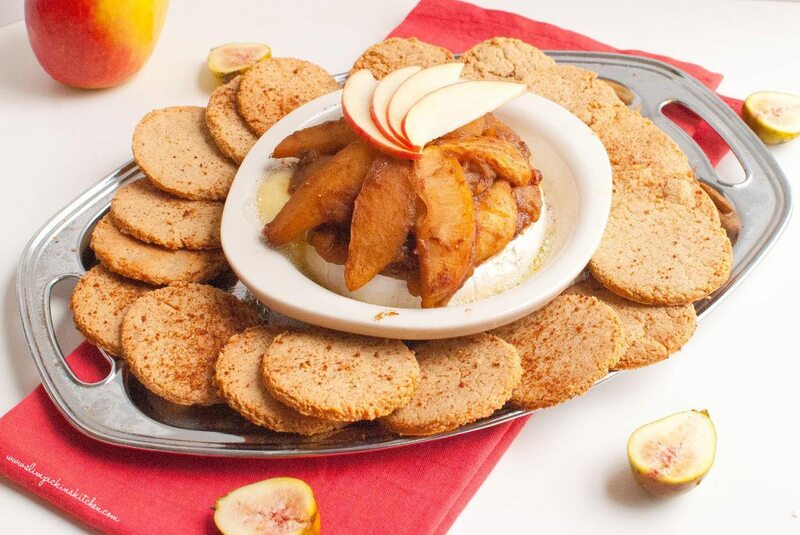 Top the brie with the vanilla and cardamom spiced apples and serve with the gluten-free cinnamon crackers. Gluten-free crackers were adapted from Elana's Pantry.